At the National Diaper Bank Network our focus is on diapers, but the truth is that other products necessary for good health and hygiene, like soap, may be out of reach for people in need. Here is one project bringing soap to people living in extreme poverty all over the world. You may have heard of organizations such as homeless or women’s shelters that collect the small unused toiletries from hotels to give to their clients. Today’s organization takes that collection one step further by collecting used soap from hotels. The mission of the Global Soap Project is to work with their hotel partners to divert used soap from going to the landfill and instead be reprocessed and reused by vulnerable populations around the world. Their ultimate goal is to impact global health by promoting sanitation and hygiene. The Global Soap Project is based in Atlanta, Georgia, but soaps are collected from participating hotels across the United States and Canada. 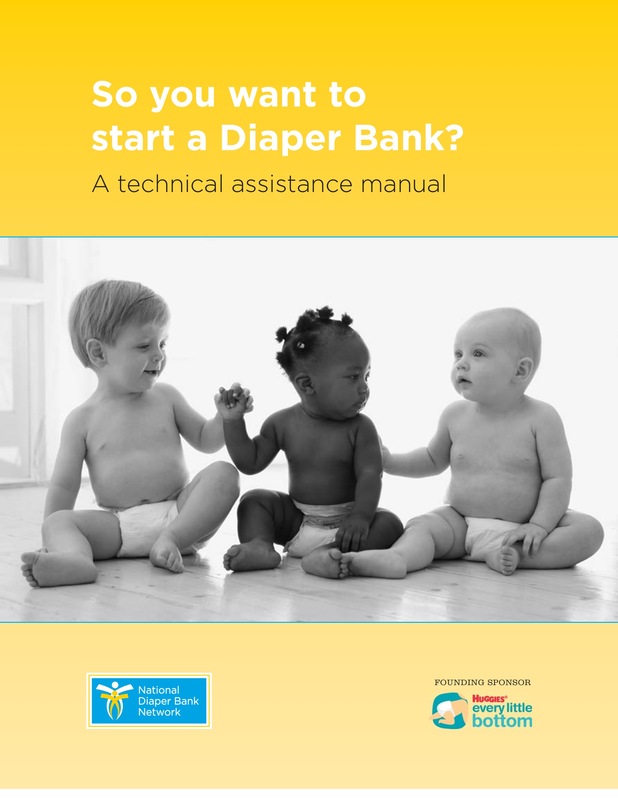 We are pleased to announce that we have published our first manual, “So You Want to Start a Diaper Bank?” I hope you find it useful. As always, if you have any questions about how to start a diaper bank, feel free to contact us at info@diaperbanknetwork.org. A good reminder that the many people struggling to support their children have often suffered a change in circumstances. The majority of individuals who are raising children alone, start out in committed relationships, and never expected to be single parents. 84% of single parents in America, are women. Andrea Rose was married for 2 years before she suddenly became a single parent. “At the time, my son was two and a half years old and my daughter was eighteen months. My husband worked while I stayed at home with our kids. We were living off of one paycheck when before I knew it, my husband left. Suddenly, he was gone and I had no income,” Rose says. In 2007, a year before Rose’s struggles began, she volunteered her time as a mentor to a single homeless mother, through a program called Bridge of Hope. As a Bridge of Hope mentor, Rose became a friend and support system for the young mother. Governmental Belt-tightening–Who is Getting Squeezed and at What Cost? As the economic hangover of the recession continues, states struggle to balance their budgets in the face of declining revenue and the perception (real or imagined) that taxpayers are reluctant to see an increase in their taxes. Because this economic stormy weather has long ago depleted the rainy day funds of many states, many states have resorted to cutting services to balance their budget. Because state governments provide many services to those who do not have the means to satisfy their basic needs on their own, many of these cuts have disproportionately affected the neediest among us. And after years of such cuts, the impact is quite severe. In The Nation, Greg Kaufmann discusses the effect of continuous budget cuts to the Temporary Aid to Needy Families (TANF) program. Kaufmann notes that Illinois provides TANF benefits—which is cash assistance—to just 13 of every 100 families with children in poverty, according to the Center on Budget and Policy Priorities (CBPP). Prior to welfare reform in 1996 the state helped nearly 87 of every 100 families with children in poverty. Further, the benefit level is only 28 percent of the federal poverty line, or roughly $4,800 annually for a family of three, similar to that in a majority of states. So as the ranks of people living below the poverty line increase, the state is less able to help keep people above the poverty line. The New York Times reports that years of budget tightening have caused Texas to cut funding to schools, resulting in cuts to all but the most essential aspects of school–no music classes, reduced bussing and janitorial services–and some of the most essential aspects of school, increasing class sizes as schools reduce the ranks of their teaching faculty. In an economic future in which workers will need to rely ever more on their knowledge base and education, students will be at a disadvantage as their educational opportunities are stunted in overcrowded classrooms taught by teachers taking on second jobs to make ends meet themselves. And in another report from The Nation, programs designed to help people secure that most basic of needs–shelter–are woefully underfunded, as county waitlists for Section 8 are flooded with thousands of applications for only a hundred openings. The federal housing agency’s annual assessment finds that “worst-case housing needs” grew by 42 percent from 2001 to 2009, and nationwide there is a shortfall of nearly 3.5 million housing units for the poorest households. Moreover, the economic insecurity that accompanies governmental belt tightening trickles down to individuals’ belt-tightening, hitting charitable donations. Researchers in the UK and the Netherlands determined that when people feel less secure about their economic resources, they give less. This thesis appears to be borne out during the prolonged economic downturn. In October 2010, the Journal of Philanthropy reported a sharp decline in charitable giving to America’s largest charities–indeed the largest decline since the journal began recording charitable giving. The next year the picture was a bit brighter; however the slight rise in giving did not erase the devastating effects of the recession, the Journal of Philanthropy reported in October, 2011. This belt tightening does not appear to improve the economy in the short term. But it does seem likely to most directly and severely affect the lives of those with the greatest need. Our national economic hangover will continue that much longer as we deal with the effects of a growing homeless population, whose children’s educational opportunities are stunted, most likely resulting in further extended dependence on public and private aid. Thus, the need for individuals to step up and help fill the void is all the more important. Consider making a donation to NDBN today.